We've been looking at fuel cells for powering portable gadgets since just about the dawn of time, so it's refreshing to learn that we'll be able to buy such a device within the next six months. 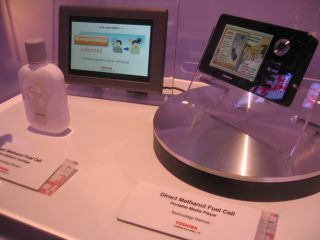 After showing off many different DMFC (direct-methanol fuel cell) prototypes over the last few years, Toshiba has promised to bring something to market by the end of March next year. It hasn't said what the DMFC-powered product will be, but we saw just such a phone at CEATEC last week and the company has added methanol power to prototype versions of its Gigabeat PMPs in the past. If we had to put money on what we'll see hit the stores first, it would be on the phone – probably in cooperation with KDDI – but we'll just have to wait to find out for sure.